Grow an Organic Vegetable Garden as a way to healthy eating! When did organic vegetable gardening first touch me personally? It was when my wife said, “I haven’t tasted a tomato like this since I was a little girl”. And she was right! Tomatoes bought in the store or those found in most restaurants can’t hold a candle to the flavor and color of home-grown organic tomatoes. Organically grown vegetables just taste better! But it isn't just the taste. Organic fruits and vegetables taste better because they are better. 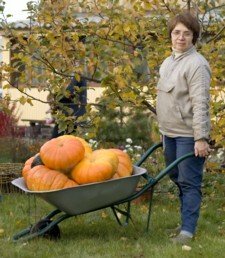 The best organic fertilizers are packed full of micronutrients, carbon, and other nutrients that you just don’t get in conventional, chemical fertilizers. This includes trace minerals, so desperately needed by the body. Plus organic fertilizers are good for the environment. One of the good things about an organic vegetable garden is that you can make your own homemade organic fertilizer. All those table scraps that are normally thrown away can be composted. Leaves, lawn clippings, garden remains and even weeds can be used, too. This is one of the best forms of organic fertilizers. There are good ways of controlling weeds and insects without using dangerous chemicals. So, why not go organic! It is better for the environment, for your soil, and for you. I use a refractometer to for brix testing the produce in my garden. The higher the brix level, the better the quality of my produce. This brix table helps to tell if the nutrition of various fruits and vegetables is poor, average, good or excellent. Nutrient-dense produce is the goal. An organic vegetable garden has a different focus than the conventional NPK fertilizer approach. The organic approach focuses on correcting problems in the soil, building up the health of the soil (YouTube video),and utilizing the micro-organisms in the soil to break down organic nutrients, making them available to the plant. The goal of organic gardening is to produce a living, vibrant soil, and to grow delicious, nutrient-dense produce. What about chemical fertilizers? How is the chemical approach different from the organic? Instead of feeding the microorganisms in the soil and letting the soil feed the plant, chemical fertilizers, applied to the soil or the leaves, feed the plant directly. Chemical fertilizers are instantly available, so they give fast results. However, the soil suffers. Click here for more information on chemical fertilizer vs organic fertilizer. Need something to perk up your plants now, not a month from now? Great news! There are liquid organic fertilizers, especially fish fertilizer, that can be used in an organic vegetable garden for quick results. Plus, unlike chemical fertilizers, they ARE good for the soil. 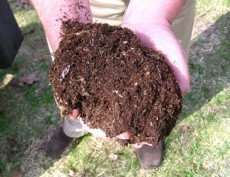 So what is the best organic fertilizer? Let me give you a hint: It comes from the ocean. There are a number of concentrated sea mineral products in the USA, each loaded with trace minerals. One of these liquid sea mineral fertilizers comes from Australia. It is the one I use in my garden. When searching for a good source of organic nitrogen, I discovered that human urine works well as fertilizer. Next, I did some research on using urine in the garden and for the lawn. Now, instead of flushing this free source of nitrogen away, I grow stuff with it. Click here for application instructions. While we are on the topic of organic fertilizer, would you like a lawn that is both beautiful, and safe for your four-footed friends? Good news! There are excellent organic options for pet safe lawn fertilizer. I started using this approach back when my front yard was nothing but a weed patch. After the first year, a small patch of Bermuda grass appeared. Each year it got larger, until it covered the whole area in front of my house. Organic lawn fertilizer that is safe for pets works really well! I hope this information has been helpful. If you want to be environmentally friendly, plus grow delicious foods that are chocked full of wonderful nutrients, an organic vegetable garden really is the best way to go.